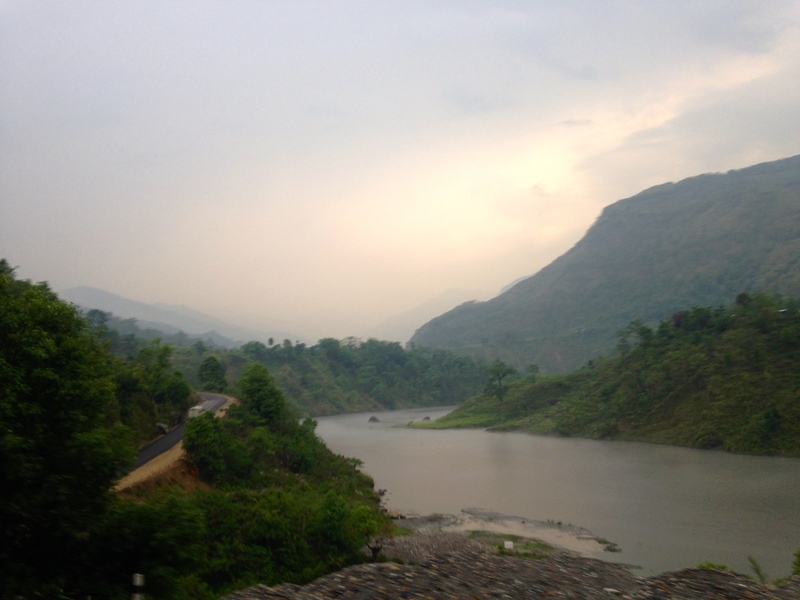 Yesterday morning all 30 of us piled in to a bus to head out to our first day of screening in Puranchaur. I kept being worried that someone on our field staff would bail out, get a flat tire, have a sick buffalo, or need to attend a last-minute puja at an uncle’s house. But everyone made it on to the bus. And it took very little time before bus songs began, complete with Live Traditional Dance By Dental Technician. Thank goodness I have 12 years of Race to the Rock under my belt. 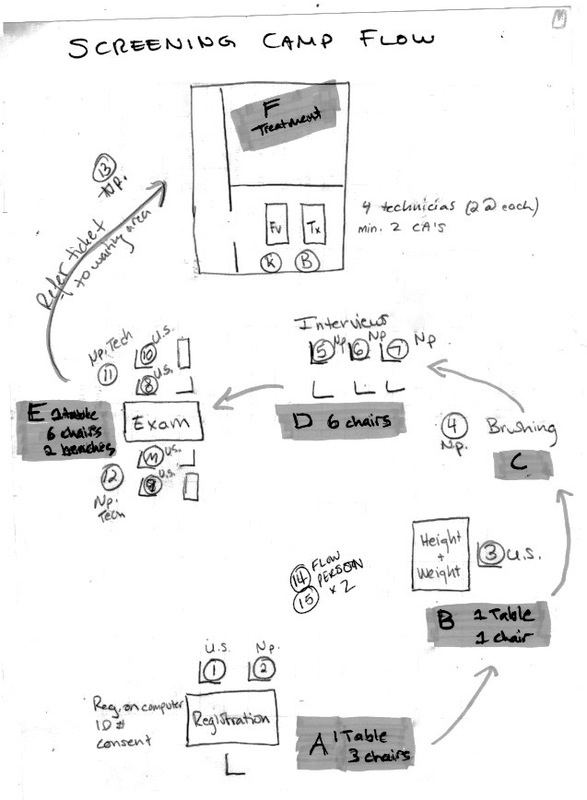 I knew to have a map of our planned camp flow, and I hoped that, as we’d been assured, the needed chairs and tables were already at the Health Post waiting for us. I’d printed out this high-tech map for everyone in their welcome packets, and I brought an extra copy of the map with me since I knew most people would leave their welcome packets at the hotel, and this series of actions allowed me to answer most questions in either language from any one of 30+ people with: “Ah. Have a look at the map! Oh that’s okay. I put a copy of the map over there. It will answer all your questions.” Tricky, right? We are aiming to have 300 mother/child pairs for Madhurima to screen in the next three days. That is a lot of people to mobilize in a rural area where people are busy cutting firewood during this season, and especially when you consider Puranchaur already has weekly dental services available, plus we’ve done outreach in schools already. We’re hoping that will work to our advantage, and that the teachers assigned in each school to run the brushing programs will bring students and mothers. But it’s also exam time, so we knew things would be slow till mid-morning. Once everything was set up, there was that familiar lull…would anything happen? Then suddenly we looked out and saw this line of primary school kids in their uniforms winding our way over the hills towards us. 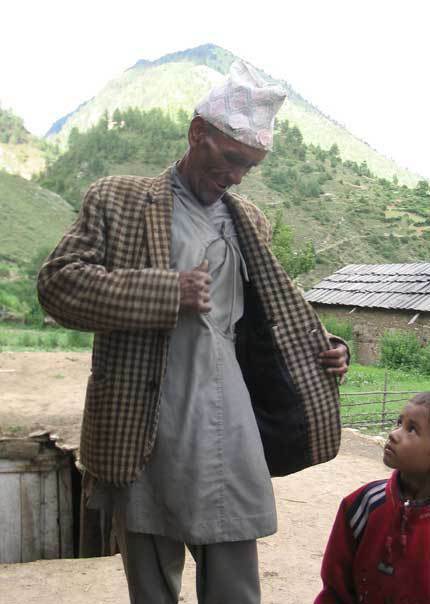 If this isn’t the cutest thing you’ve seen related to dental care outreach programs in mountainous regions, you have no heart. I want to explain how we organized this project using a human-rights design, because it seems obvious, but actually, a lot of these details are rarely prioritized. 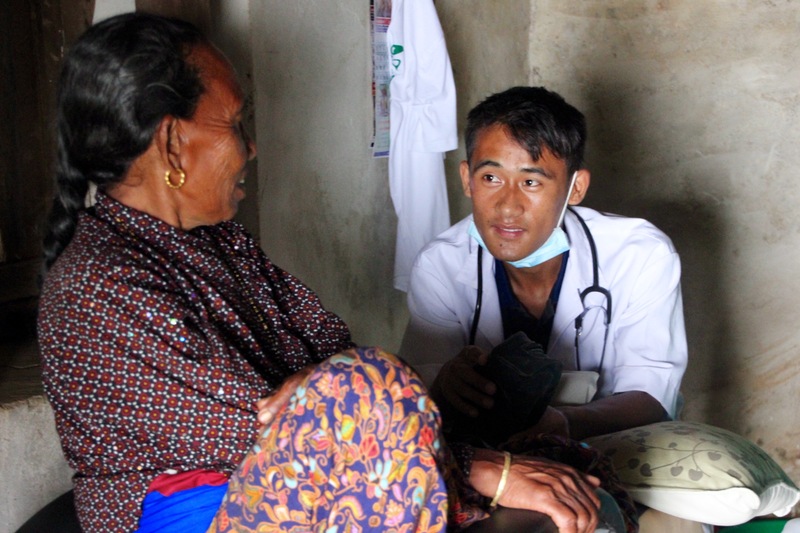 What we care about with JOHC is the development of dignified, sustainable, high-quality health care for rural Nepali people. It was important to me to set up this collaboration in a way that promoted the development of local services, which meant not only studying interventions or issues in the abstract, or providing a transient benefit to participants in a study, but building the manifest capacity of local providers and institutions. Fortunately, although JOHC is small it is mighty, because we have those providers and are already working with all the schools, the local government, and the local Health Post in Puranchaur. The involvement of our team leaders and clinic staff in this project was a great development opportunity for them – and therefore the communities they work in – and as long as consciously nurture it, that benefit occurs regardless of the outcome of the research. We were also able to set up this collaboration as an opportunity to strengthen and test our community relationships. Our preparation involved a great deal of mobilization, largely done by our team leader in Puranchaur, who is himself a local resident. We’ll still be in Puranchaur when the week is over, so we’re accountable and vulnerable to the way in which the program impacts the community and its power structures. Which is as it should be. In short, the project is about Puranchaur and the other villages where our teams work, not about us, and that’s what I care about. Of course, we still had our breaths held all morning. We had kids, but would we get mothers? But as the day went on, the pace picked up. Things got so packed in the clinic upstairs, where our technicians were providing their usual treatments plus the new fluoride and silver fluoride treatments, that by the second day, we needed to move to a large training hall. On the second day, as word got out, we got even more people – about 140. Bethy and Keri were able to provide intensive oversight to our technicians as they worked; our team leaders were collaborating with the UCal students to conduct surveys, help with dental exams, and provide the same oral health and brushing instruction they do already in their home villages. On the ride home that evening, our team leader Kasev, who had been conducting interviews with mothers, said that many participants referenced the school brushing programs when talking about their health practices. It was as awesome a day as we’d have dared to hope for. Tomorrow we are off to Hansapur, a non-working area where we had to apply our best strategies to get the word out. It’s a great chance to get some anecdotal evaluation of differences between an area where we work, and one where we haven’t yet. Let’s hope we get as good a response as we did today! I’m already in the last week of my visit, and as usual things have flown by too fast. This monsoon has been more spirited than last year’s, blanketing us in torrential downpours every night and through each morning. Finally this week the weather seems to have calmed down, but I’m missing the cool and comforting feeling of the rain closing us in with its clattering and clanging. The main focus of our summer has been a new foray into the world of health care advocacy. 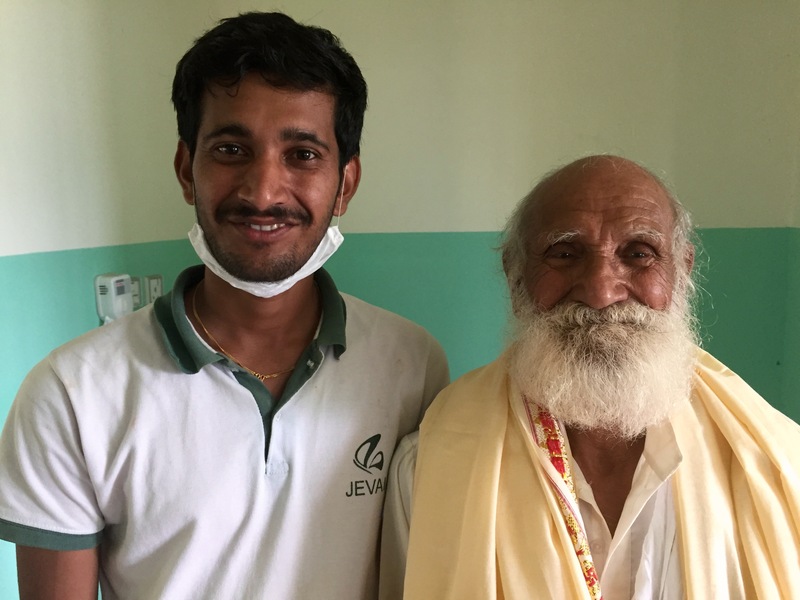 We have a model for rural dental medicine, and we want Nepal’s government to fund dental clinics in all of its village Health Posts. Our idea is that if the government would set a standard at which it will finance rural dental services in the national health care system, then the global development industry will start doing what we’ve doing: training, mentoring, supervising and auditing rural dental technicians so they meet the standard (which we can help define). 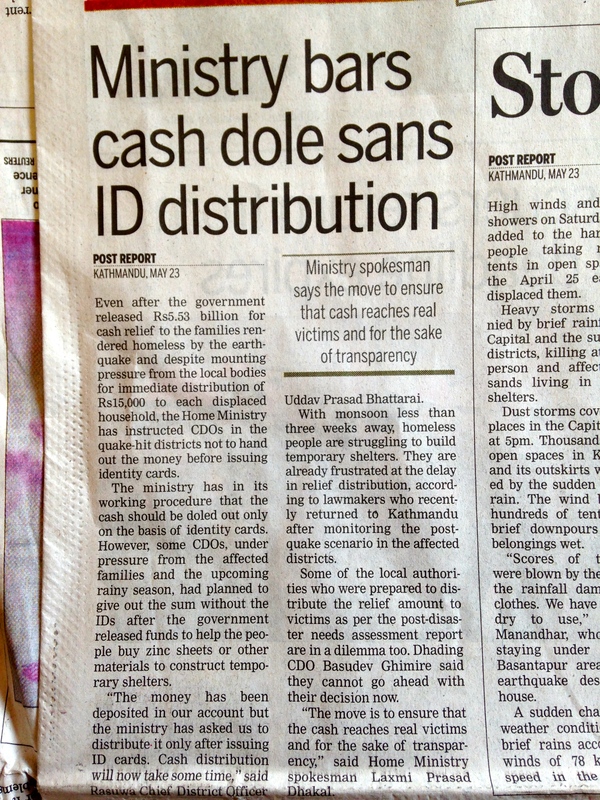 As far as I know, we’re the only organization in Nepal working on this particular topic in this way. 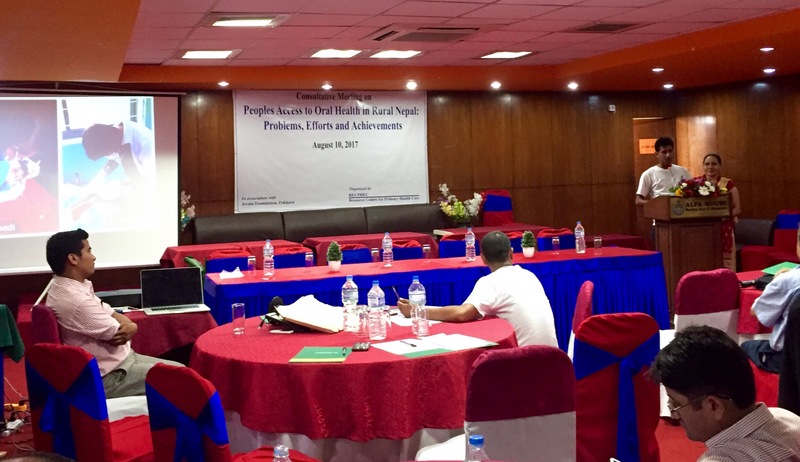 Like many developing world countries, there’s a complicated and often mutually distrustful relationship between the aid sector and the government of Nepal. This largely results in aid agencies privatizing their projects as much as possible; I’ve done this myself, because it’s easier to just do something right yourself than manage a hassle of hectic and sometimes exploitative bureaucracy. Mean time, weak governments spin out more and more self-serving regulations against a flood of foreign funding that is trying to silo itself. Ultimately, it’s development itself that suffers, as decades-old aid industries, still chasing down base level poverty, make apparent. 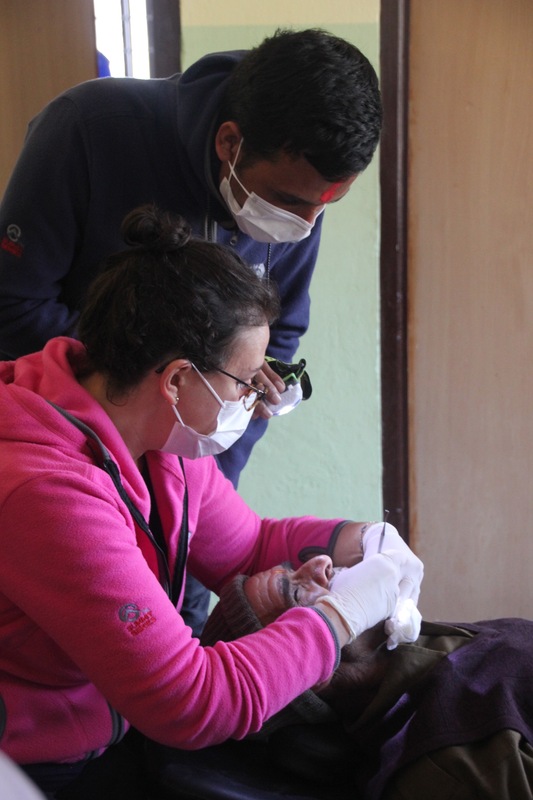 So something that excites me about what we’re doing now is that, setting aside dental medicine itself, I see the process we’re in, if it works, as a strong example of effective collaboration between the private sector, which is great at risk-taking, innovation, and raising money, and a developing-world government, which, at least in Nepal, is by far the best option for scale and stability. I like to think this is a version of life where we all do what we’re good at, with respect for the reality that we need everybody if we’re going to think big and get somewhere. Now then. 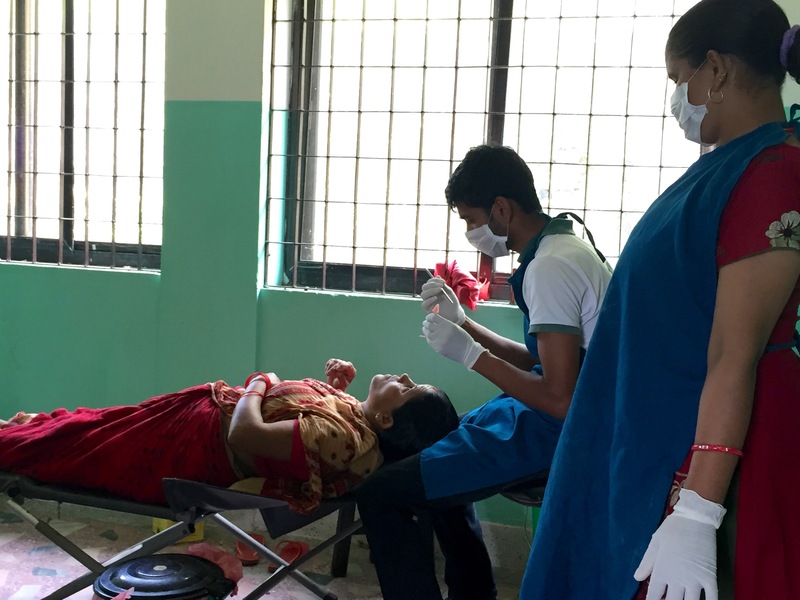 Should you choose to work on rights-based health care policy in the developing world, which you might have been considering, here is your primer on how to get started (after refining your particular service of choice for 10 years). Our advocacy happens at three levels, beginning with the village level, where we’ve been pushing for permanent local government funding. This is not for the faint of heart and best suited for people with a good sense of humor. You’d better be down for a ride that’s 90% culture and 10% policy, and heavily focused on navigating relationships, social dynamics, and weather. The village level is where we’ve focused most in the past, so we’re reasonably adept at this…except that the reality is that institutional services just aren’t very stable at this level. Next is the district government, where we’ve previously had only very simplistic coordination, such as required letters to required people. But it’s the district government that sanctions and distributes village budgets, so without support here, it’s a lot harder to get anywhere at the local level. 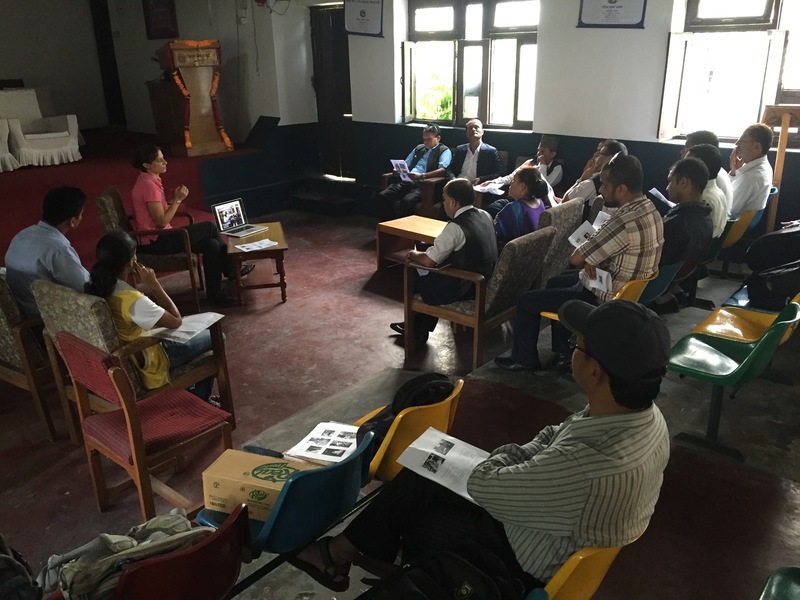 The other day we had a District Coordination Meeting where our program director and I presented (in Nepali!) 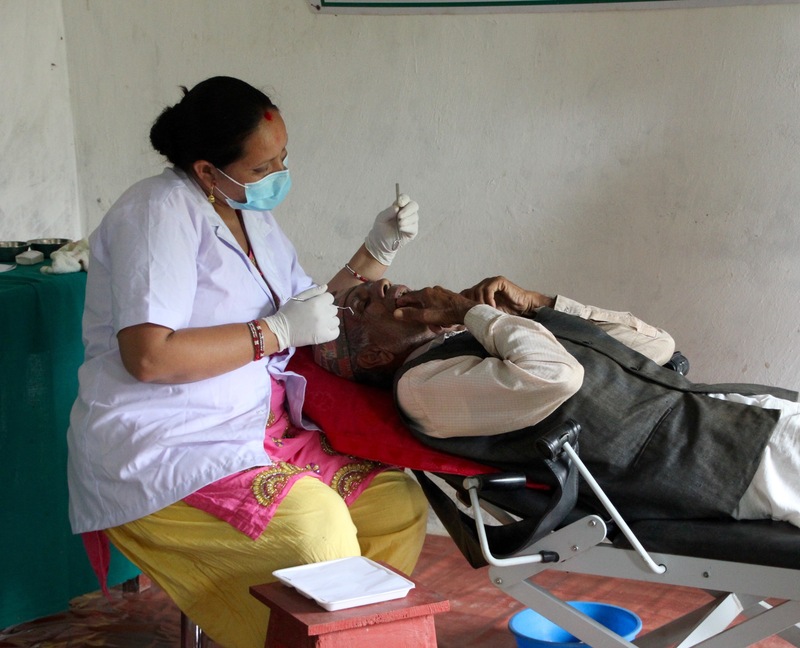 on the role of the government in extending our oral health care model to its predominately rural population, filling a gaping hole in the primary health care system. This meeting exceeded our expectations – we received a lot of positive feedback and useful criticism. I was lavishly complemented, of course, on my village accent. Lastly, the day before I leave Nepal, we’ll have our first workshop at the central level in Kathmandu, and with this, we’re leaping in to completely new territory. But this is ultimately where it’s at: it’s the central government that fixes funding priorities and distributes earmarked budgets through the national health care system. 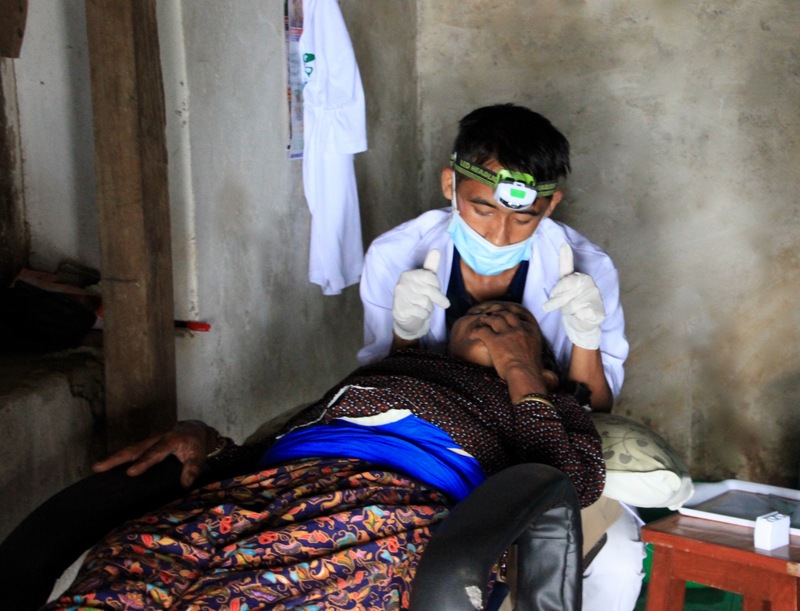 Recognition of our model at this level would set up a standardized place for rural technicians in Health Posts, providing a framework for agencies with a lot more money to invest in creating rural dental technicians who can then be permanently staffed by Nepal’s own government. We’re feeling emboldened and encouraged after learning a lot from each and every meeting we’ve had so far. Despite my own resistance in the past to clunky public systems, at this stage of the game, I’m finding some of the cumbersome government procedures to be oddly reassuring. They give us steps to take. We’ve met some very decent and hardworking public officials over the summer, even if they receive us with skepticism and give us some hard knocks. I think this has actually grown our confidence. We can wait for the meetings, answer the questions, submit the documents, do all the things, because we have confidence in our product. There’s also the humbling reality that the government has plenty of reasons to be cynical of the social work sector, so if we have to prove ourselves, that’s fair. It’s forcing us to be both meticulous and more adaptable…eventually, we’re responsible for creating our own good luck. 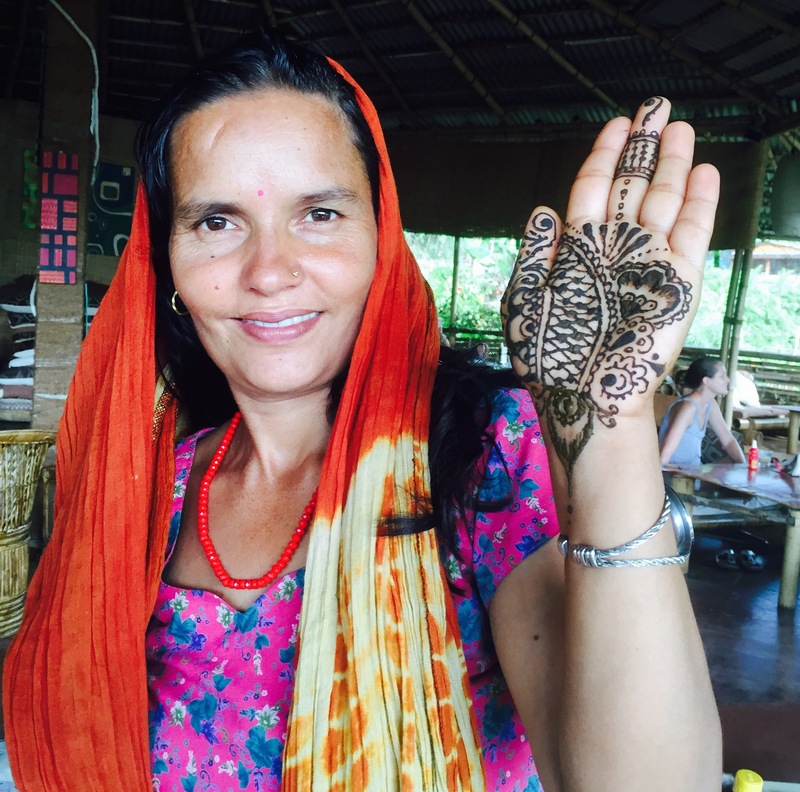 Besides that, rice planting season concludes with a wonderful festival where everyone puts on green bangles and paints their hands with henna. Kaskikot’s premier henna-drawer has become none other than yours truly. What did you expect with an activity where people let you doodle on them with temporarily-staining plants?! Govinda’s porch had an hour long wait for these skillz on Saun 1. 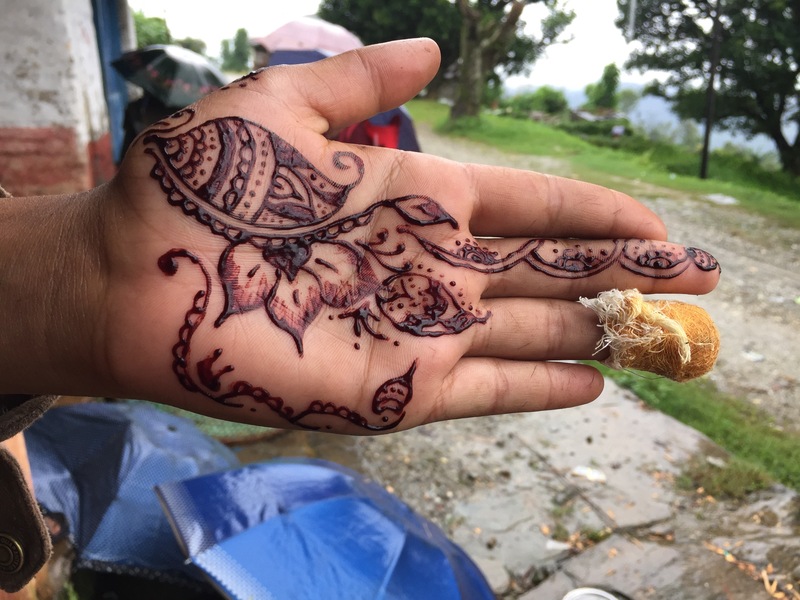 The best thing about the henna designs is that you start with an idea, and then it becomes a meditation that designs itself, following a pattern in the creases and borders of someone’s palm, incorporating smudges and wayward marks in to unexpected flowers and vines. You just can’t say before you start exactly what you’re gonna make. Last Thursday, our meeting with two district officials in Lamjung was so encouraging that I’d been energized all weekend. I talked with a friend at home who did her thesis on post-earthquake housing in Haiti. My dad helped me get in touch with the inventor of earthbag building. 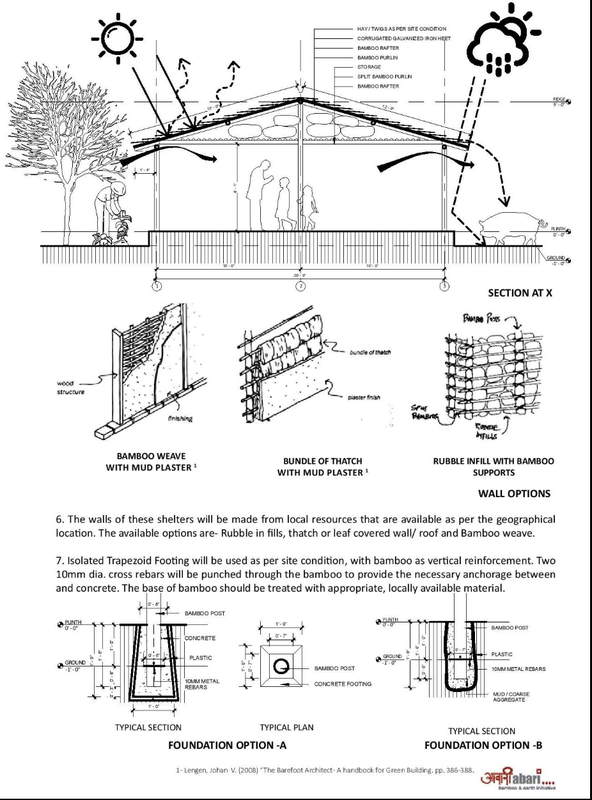 I pored over diagrams on the internet and learned the term “waddle and daub.” I was looking for every possible way to supplement a government housing kit consisting of tin roofing and tools. And of course, I talked with a few people about my safe-box idea. 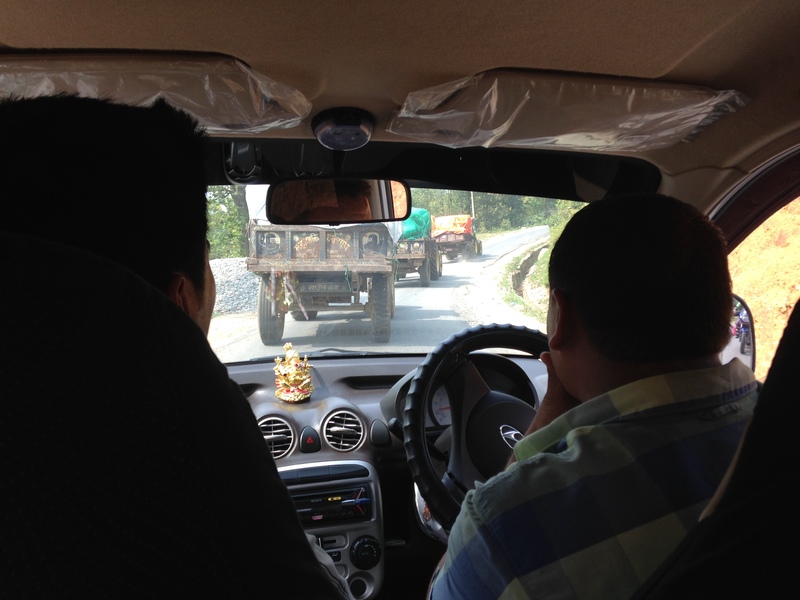 Aamod and I made our second trip out to Lamjung on Monday, for the shelter cluster meeting. 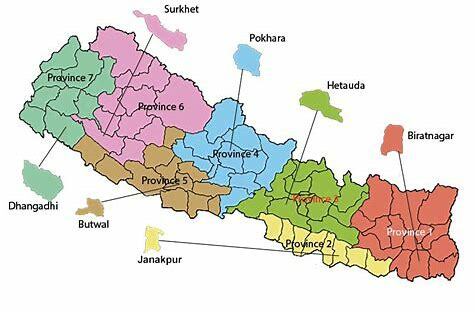 (Relief coordination between large iNGOs and the government is divided in to clusters of which shelter is one). We somehow managed to be an hour late again, which this time meant entering a room of a few dozen government officials and representatives from big international organizations. We sat down in the corner and I took out my notebook. A slide up on the projector showed the names of about six multinational agencies, the villages where they’d been assigned to provide housing, and the number of households covered by each agency, which ranged from about 900 – 1500. Then on the bottom row was our name with two blank columns next to it – no villages yet assigned – and “100” in the righthand column under number of houses. Well, A for effort, anyway. Besides, with the possibility of using the government’s housing kit, we were hoping to get that number up to about 300. 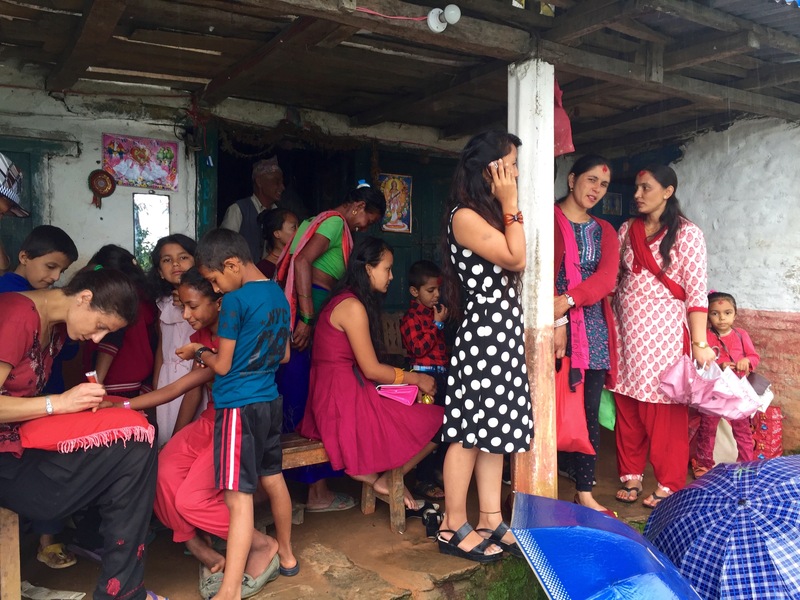 But the next hour was nothing like either our personalized visit with Lamjung’s district officials a few days earlier, or the big health cluster meeting I’d attended in Kathmandu. Today we were in a room of local politicians talking about use of resources. And my prior enthusiasm was quickly put in check. Within minutes after we arrived, a discussion about reassigning some villages from one organization to another turned in to a 15-minute debate over whether aid agencies should be allowed to flash their logos while working. After all, it’s the government that should come out with the recognition – is housing aid to become no more than advertising anarchy? 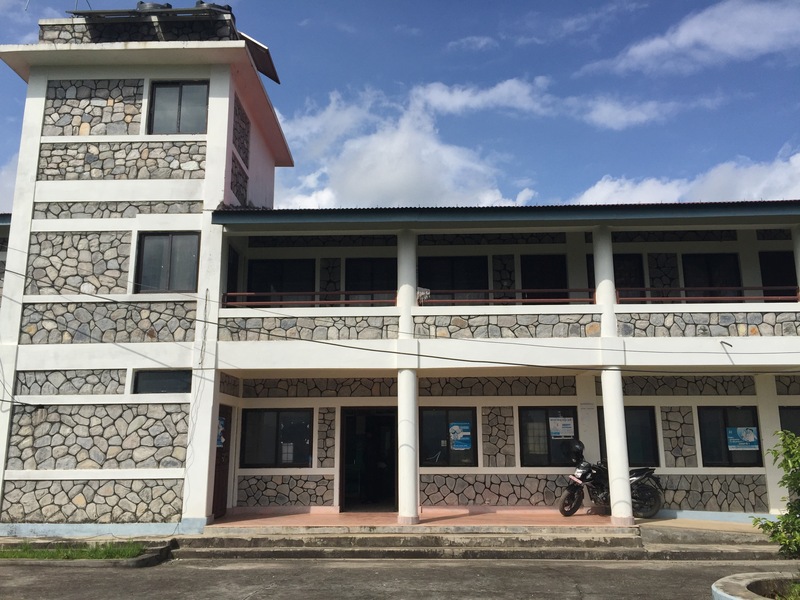 All the big iNGOs have Nepal offices with all-Nepali staff. As I watched the Nepalis representing those agencies negotiate this discussion, even I started to get lost as to who was allied to what cause. I basically understood why these folks engaged a conversation about who would get credit instead of pointing out the more urgent matter of thousands of homeless people in Lamjung; let’s call that standard operating procedure, a necessary hurdle to eventually getting back to housing. the massive upcoming procurement of corrugated tin roofing, I couldn’t keep up. This guy was working for a huge iNGO that needed to get tin in order to help build shelters. To put this in context, Nepali villagers can build anything out of anything. 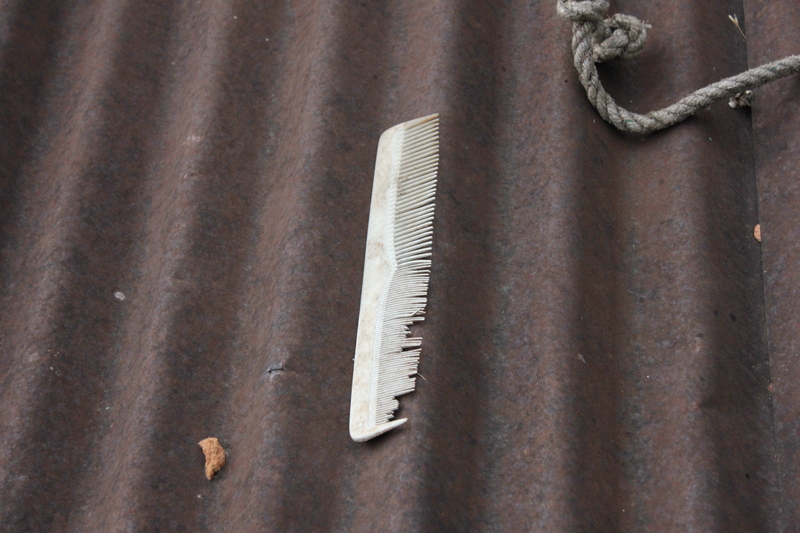 The overall approach being used with transitional housing is to provide a critical piece of hardware – THE ROOF – and let people build around it. Foreigners in the room had already explained why their agencies were working on getting corrugated tin from multiple sources to meet the need as fast as possible. Why would this guy, tasked with representing his iNGO to the shelter cluster, encourage all these government officials to control and inevitably slow down the process? Was he bluffing? Maybe he knew his suggestion would never work out, but would satisfy egos and clear the way. Or maybe he meant it. It was either brilliant or terrible, but I still don’t know which. Finally, one of the European aid workers spoke up. I’d noticed him sitting off to the side, a burly, hearty looking man with clear blue eyes and a tousle of graying hair. 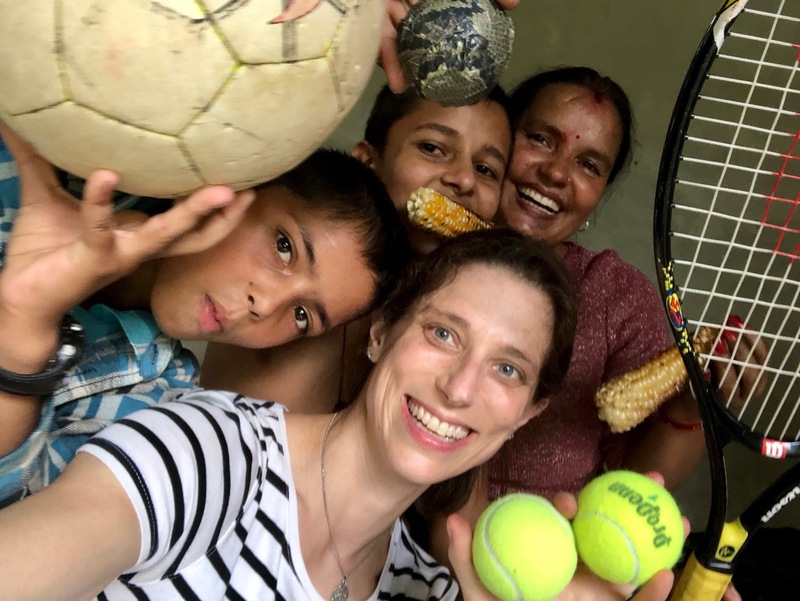 He captured all my biases – obviously a disaster professional, not a Nepali-speaker, here for Earthquake and that alone, bored with these talking games that I’ve come to sort of enjoy as sport. He was keeping a feel for the pulse of the conversation while mostly ignoring it, looking rather peeved. In a few swift paragraphs, this guy listed the amount of corrugated tin available in Lamjung district, and in Nepal as a whole – about 10% of the tin needed for the number of houses destroyed. He knew exactly the number of trucks he needed to transport housing materials to his coverage area; the amount of square footage needed to store all the supplies. He pointed out that accomplishing all this was a massive task and that the monsoon will be starting imminently. “If we could please finalize which of us are taking which areas, than we can all get to work,” he said. Even I was taken down a good notch, as I am so accustomed to all this politicking in Nepal that I’ve come to expect it, even though we’re in an emergency. And there’s more. 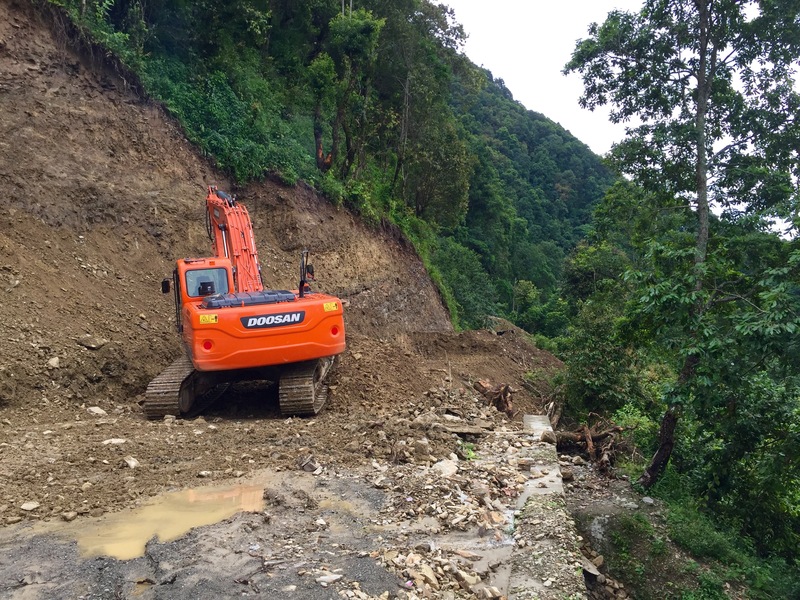 The government has established a policy to give two sheets of tin to each family that needs to rebuild – but there isn’t nearly enough tin in Nepal to deliver on this quickly without a lot of smart planning and international coordination. So instead, Nepal’s government has decided to give everyone $150 in cash to buy their own tin. “We have controls for that,” said an official. The matter was never totally resolved. Later, Aamod and I discussed why on earth Nepal’s leaders would willfully do something like that. The only reason can be to to pacify constituents quickly with cash rather than sorting out the more complex problem the population is actually facing. People will be pleased with receiving $150 and they won’t realize it’s useless because the thing they most need is nowhere to be found, or is now worth $450. I wonder if this cash reimbursement matter is getting any coverage in the U.S. The only reason it won’t cause an economic collapse in Nepal is because there’s no more room to fall; people literally have nothing. So instead it will just put the most urgently needed commodity – sheets of corrugated tin, for goodness sake – out of reach by displacing the government’s responsibility to provide it on to people who can’t possibly solve a material shortage. I actually watched a group of politicians look at each other, confront this fact, and, from what I could tell, decide to do it anyway. It felt as though this inflation matter was a good point, but a lot of trouble to solve. It’s a perfect example of the structural rot that weakened this country long before an earthquake shook its softened beams to the ground. Just to put icing on the cake, before we left, we found out that the district had changed its mind about providing a government housing kit for us to use. In fact, the friendly engineer we talked with the other day – Pradeep – a genuinely sincere guy who seemed to like our idea of collaboration, said the official policy is now that government is only to deliver its tin (or $150) in places where NGOs are NOT working. As for the entire housing kit, which includes things like nails, wire and hammer…that’s just a suggested kit. The big multinational agencies will use it, but the government won’t. I knew it had all seemed to good to be true. Didn’t I say it was a miracle? I made a hard pitch to Pradeep that he and I had the opportunity to set an example for how community organizations can collaborate to achieve the work of the government. 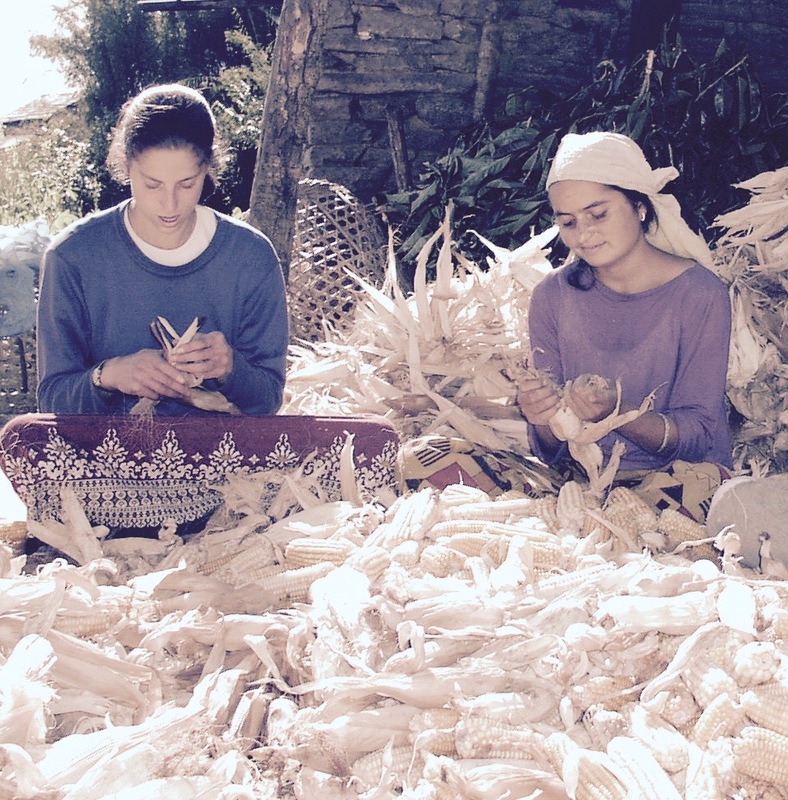 There are countless groups like Eva Nepal running around providing aid with tremendous energy. He actually liked my idea a lot, but said I’d have to write a proposal and send it up the chain. We all know how long that will take, and in the mean time, people are living under tarps. It’s not the time to play games. 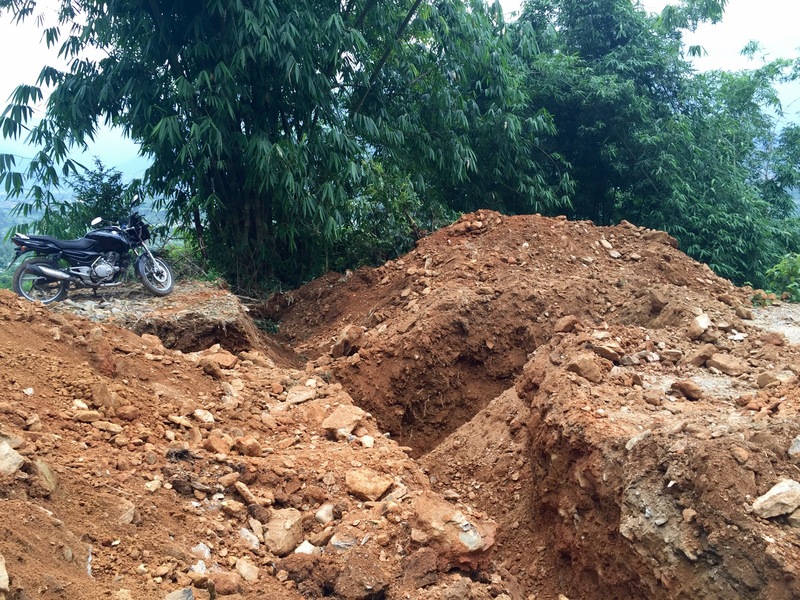 Looks like if we want to work on shelters in Lamjung, we’ll have to bring in all the materials ourselves.